The University of Notre Dame Center for Civil and Human Rights, in partnership with Hesburgh Libraries, will unveil Convocate — the first online research tool for simultaneous searching of Catholic social teaching documents and the instruments of international human rights law — on Friday (April 21). The launch will include a public lecture and reception. 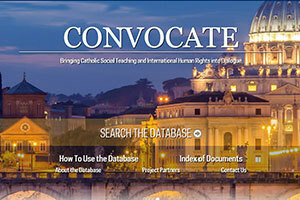 Convocate is a free online database designed to help scholars, students, practitioners, advocates, public officials, diplomats, ministers, pastors and concerned citizens compare documents from Catholic social teaching and international human rights law for the purpose of investigating the convergences and divergences between the two fields. “This repository and state-of-the-art interactive database will facilitate interdisciplinary dialogue between Church social teaching and international law — the links between human dignity and human rights,” said Jennifer Mason McAward, director of the Center for Civil and Human Rights and associate professor of law. Expert consultants on the project include Notre Dame faculty in law, theology and political science, as well as experts from other universities. Developers also engaged with sources at the Vatican, the United States Conference of Catholic Bishops, the United Nations the International Labour Organization and others to compile documents from both disciplines. Within Hesburgh Libraries, Convocate was developed by the Center for Digital Scholarship and the Web and Software Engineering team. The digitized documents are accessible in full and searchable by topic or keyword for comparison. “By adding metadata to each document and embedding text mining techniques across the corpus, disparate resources may be matched or explored according to a researcher’s needs,” said Tracy Bergstrom, co-director of the Digital Library Initiatives and Scholarship Program for the Hesburgh Libraries. Created for a diverse audience and built on an interdisciplinary framework, the platform is designed to grow as more documents are added over time, and will also include secondary sources specifically commissioned for the project. Originally published by Amanda Skofstad at news.nd.edu on April 19, 2017.